It comes with no surprise that the heat maps produced from the data collection from studies using eye-tracking technology (following the eye movements and fixations of those participants in the study on how they look at a webpage) is all the rage in discussing and uncovering how visitors behave when looking or interacting with a webpage. However, many companies cannot afford to have this research done for their own actual website or are not willing to invest in their own study if they can indeed afford it. Therefore, many companies therefore rely on the common findings from reputable already published studies in order to increase the usability and effectiveness of their own websites (towards the bottom of this post I will discuss software that you can use to uncover related data on your own). Probably the most famous study that over the past few years that we have all heard or read about are the findings from a study that Jakob Nielsen performed which uncovered the F-Pattern – the F-shaped patterns that users follow when reading content on a webpage of looking across the top of the content, then move down the page to read again horizontally across the page -but usually not fully across the page, and then finally quickly scan the left side of the page from top to bottom, this forming in most cases an “F” shape if you were to draw lines for where their eyes moved. A heat map was then produced to display the cumulative results from the study by providing insights into how the readers actually read the content on the page, not only visualized in the heat map by the density of those areas that were fixated on the most, but also by the colors red, yellow, green/blue and gray representing how “hot” a particular area was (red showing that area was viewed the most, blue the least, and gray not at all) that was read. Start subheads, paragraphs, and bullet points with information-carrying words that users will notice when scanning down the left side of your content in the final stem of their F-behavior. They’ll read the third word on a line much less often than the first two words. CrazyEgg – provides Click HeatMap, Click Confetti (find out where people click based on their referrer, search terms, etc. ), Site Overlay to look at the hard data, ability to share results and export data. Live reporting. ClickDensity – provides Click Heatmap, Click Map (shows where all clicks are on page), Hover Map which displays usage data for individual items on your page, Page Summary stats, specify an internal page (URL) that a visitor must have viewed in their session BEFORE the current page or a page (URL) that a visitor must have viewed in their session AFTER the current page, ability to save heatmaps etc as a .jpg. 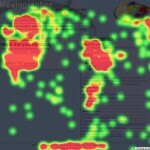 ClickHeat – provide a visual Heatmap of clicks on a HTML page, showing hot and cold click zones. While not as robust as the tools mentioned above, it is however free (Open Source). Have you used other clicktracking tools and would like to share them? Let me know!